Seeing a cosmetic dentist for the first time typically involves preparing for a procedure to make your teeth look better. However, there are specific complications that we need to treat first before giving anyone the ideal smile they prefer. In the modern world, there are very few reasons why a person cannot have the smile that they find to be a perfect representation of themselves. 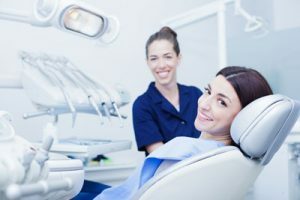 While there are many problems that can cause a smile to be less than amazing, there are techniques like dental veneers that a cosmetic dentist can use to help overcome those difficulties. People often ask us about a patient’s eligibility to get dental veneers. The reality is that there are no set criteria other than wanting or needing to fix teeth for a better-looking smile. With any medical procedure, there are a number of precursors that apply, despite the fact that placing dental veneers is a cosmetic procedure. The patient must remember that when a cosmetic dentist places dental veneers, there is an element of permanence. Dental veneers stay in place for a very long time, making it imperative that the teeth are in excellent condition before we begin the process. This process involves shaving down the enamel, custom-fabricating the dental veneers for the patient’s teeth and making sure everything fits properly. An active infection in the patient’s mouth would be one reason why we would pause from completing the procedure quickly. While dental veneers are one of the cosmetic dentist‘s fastest applications, we want to ensure the teeth are healthy before we start the process, so every dental veneers consultation begins with a comprehensive examination of the patient’s mouth to catch any potential problems. Even if the patient does have something that needs correcting, by and large, they are smaller problems that we can quickly resolve to place the dental. Dental veneers can also correct a number of problems, but in order for them to do so, we have to place them in a way that does not cause them to fail. Thus, it is imperative we find and fix any underlying problems that may lead to a slower healing process, may damage the dental veneers, or may cause issues with the teeth onto which the veneers are being placed. As such, we look for two important problems with teeth that are very common when we place veneers. The first is an infection. If the patient has a tooth or gum infection, we will want to wait to place the dental veneers until after the tooth infection has been cleared up. Antibiotics and other remedies can be used before the cosmetic dentist will be comfortable shaving the teeth to place veneers. The second problem is an untreated cavity. Since the veneers only cover a portion of the teeth, unlike dental crowns that cover a larger portion or dental implants that replace the whole tooth, it is important to ensure there are no cavities on the tooth before or in the immediate vicinity. For more information or to schedule an appointment with us, call (201) 620-9576. Our dental office is located in Northvale. Call Bergen-Rockland Dental Associates, LLC today.